There is such a variety of bar glassware out there that it can get confusing to decipher which ones accompany which drinks. And you may be thinking that one glass is the same as the next. But this is simply not true. All bar glassware is shaped differently for a purpose. In addition to aesthetics (the way the finished drink looks), the different shapes and sizes of the glasses contribute to the overall flavour of the finished drink. With wine glasses, for example, the bouquet of the wine cannot be fully realized without having the right shaped glass. Since taste is very much affected by smell, wine drunk out of the wrong glass won’t taste as good as when the proper wine glass is used (and you likely won’t be able to tell unless you try the right wine with the right and wrong wine glass). And for champagne, it is important to use a champagne flute so that the bubbles can travel freely upwards and the champagne won’t go flat prematurely – as with a glass with more surface area. One other note regarding bar glassware is to always ensure that the glasses that you serve drinks in (or receive drinks in) are spotless. Glasses that are not cleaned properly, will also negatively affect the taste of the beverage. All Glassware photos are a clickable link. open a new window and access our Barstore. Bar Glassware and their uses…. Brandy Snifter – shaped liked it is so that the user can hold the glass between their fingers while the base of the glass sits in the palm of their hand. This allows the transfer of heat from the palm of the hand to the brandy, thereby slightly heating up the liquor. 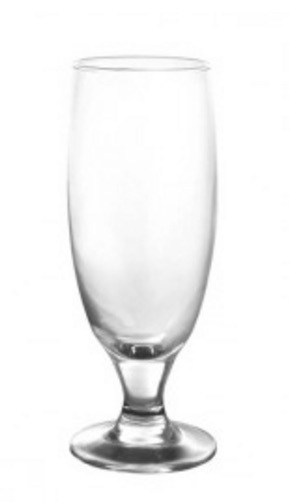 Champagne Flute – The elongated shape of the flute allows the bubbles to travel upwards and not dissipate too quickly. If the bubbles disappear too quickly, the champagne will taste flat. Cocktail Glass – Certain cocktails, like a tom collins or the hurricane, have their own specialty bar glasses. For all other cocktails who weren’t popular enough to get their own glasses, bars use generic cocktail glasses. Generic Beverage Glass – Multi-purpose bar glassware. From the glass accompanying a bottle of beer to more standard cocktails like the Bloody Mary and Bloody Caesar, this is your all-round, all occasions glass when the right glass isn’t available. Goblet – the goblet is commonly used in banquet halls for water and juice and sometimes used in bars (that don’t have the proper glassware) for various cocktails and soft drinks. Highball Glass – Highball glasses such as this are used for a variety of cocktails and mixed drinks like a gin & tonic or rum & coke. Hurricane Glass – The origin of the hurricane cocktail can be traced back to New Orleans where the first one was served in the now signature hurricane lamp shaped glass. Classic Margarita Glass – This is the classic style margarita glass, although there are a couple variations floating around (like the one below). Margarita Glass: Saucer – Another popular style of margarita glass. Martini Glass – aahhh the martini – Shaken, not stirred according to Mr. Bond. Martinis have their own special glasses and although this is a classic looking martini glass, there are many variations on the market today but you should still be able to recognize it by its triangle-shaped bowl. Old-Fashioned Glass – the glass made specifically for the drink, the Old Fashioned, this glass is often used in bars and clubs as a common rocks glass for mixed drinks such as a rum & coke or vodka soda. Beer Glass – of the Pilsner variety. This is a generic glass commonly accompanying a bottle of beer. Some establishments may use this glass as for their half pint beer glasses. Pilsner Glass – This is the classic Pilsner glass which was originally meant to be served with….well, Pilsners. Today, you’ll see bars use this glass as a generic beer glass – either for small pints of beer (half pints) or accompanying any kind of bottle of beer, from Pilsners to Ales to Lagers and more. Pint Glass (for beer) – This pint glass, also called a sleeve due to its shape, is a very common glass for serving pints of beer (20oz in North America). Depending on the variety of glassware at certain pubs and clubs, this glass may be used for serving soft drinks or cocktails such as the Bloody Mary and Bloody Caesar. Wine Glass – You can literally find a wine glass for every variety of grape available in a bottle. However, most bars usually only carry one and maybe two different wine glasses. If they carry two different wine glasses, it’ll be one for the reds and one for the white wines. This is a typical shape associated with red wines as they tend to have fuller bodies with smaller openings. Rocks Glass – This is the standard in most bars. The glass that’s used for the majority of mixed drinks that leave the bar. Any bar rail shot, as in a gin & tonic, as well as liquors served straight – rum on the rocks, are served in this glass. Specialty Coffee Glass – This glass is meant for specialty coffees and specialty teas. The handle ensures that the guest doesn’t have to worry about wrapping his hands around a steaming hot glass (although this is recommended for those really cold North American winters 🙂 Common drinks served in this glass include Irish Coffee, Brazilian Coffee, B-52 Coffee and the Hot Toddy and Blueberry Tea. Shooter Glass – This is the standard measuring glass for a lot of bars as well as doubling as a shooter glass for any shooter. Where in use, the bartenders use this glass to measure the amount of alcohol served in each drink. And when customers order shooters, they are served in this glass. A must-have in bar glassware. Shot Glass – Very similar to a shooter glass, this is another style of measuring glass used by bartenders to measure out the amount of alcohol going into each drink. This glass can also double as a shooter glass. Note that due to breakage, many clubs use plastic shooter glasses. Bar Glasses – Tip #1: When cleaning bar glasses, always use a soft detergent like vinegar and water, but not soap. When washing the bar glassware, handle it by the base and then dry and polish with a soft, dry cloth. Bar Glasses – Tip #2: When serving drinks, make sure that you don’t handle the customer’s glass anywhere near where your customer will be putting their lips (i.e. handle the glass by the base whenever possible).